A few years back I sat staring at my laptop screen which was displaying the images from the movie IRobot that had appeared on AUGI website. I could not believe these had been created using Revit! Inspired by this and the work of legendary Revit guru Phil Reed, I set too and applied my Revit modelling skills to one of my favourite movies, Star Wars Empire Strikes Back. In my view this is the best of the Star Wars movies, but that’s only my opinion. I decided to model one of the AT-AT walkers which attacks the Rebel base on the Ice Planet Hoth (yes it’s sad, I actually know the planet names). I started by searching the internet for images of the At-AT Walker. 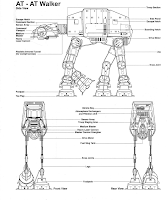 There are numerous websites which provide detailed plans and elevations of Star Wars spacecraft and vehicles, eventually I found one for detailed plans of a AT-AT Walker. Next I fired up Revit and placed a number of reference planes which I named. 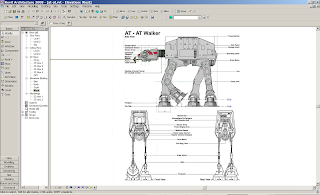 I then imported the jpeg plan of the AT-AT walker in plan, front, side and rear views, being careful to align these with the previously created reference plans. This was rather tricky as I needed to make sure that the imported jpeg aligned correctly in each view, so when I placed geometry everything would project correctly. I modelled the main body first. This was an inplace family, using voids blends and extrusions to cut away various parts of the geometry to get the form I was looking for. Once this was achieved I then modelled the head of the AT-AT using the same principle. Getting the sloped cuts around the cheeks of the head of the AT-AT was a little challenging, but a few angled reference planes and faced based geometry resolved this. 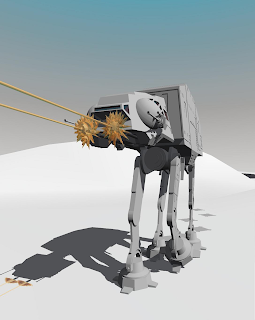 The main guns which are mounted on the head of the AT-AT again where modelled as inplace families using extrusions, blends and sweeps to match the background jpeg plans. The only items which I built as separate families where the AT-AT walkers legs and feet. Again, using the same principle of jpeg plans, these where modelled as separate generic model families and then transferred into the main model and aligned and angled to reference lines to match the legs of the background plans. The laser blasts from the front of the cannons were in interesting challenge. Using the same solid / void bullion modelling approach as previously described, the main form was a made as a solid sweep, then using a void extrusion as a cookie cutter. 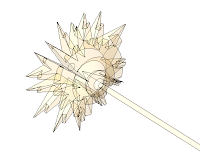 I cut away the sweep to form what represented a blast from the laser cannons. A suitable transparent material was then applied to this and voila you have what looks like a laser blast! The snow terrain in the background of the image is a standard Revit terrain, but with the surface material changed to snow. The footsteps in the snow from the AT-AT walker are just the standard Revit pad tool placed at various offset locations. 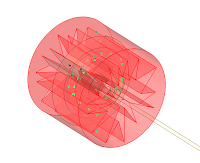 See the model in 3d using Autodesk Freewheel. What this exercise achieved for me personally, was to prove how powerful Revit is at pure modelling. People are always saying to me that Revit can't model this and it can't model that, this is just not true! Ok, it may not have all the fancy modelling tools of products like Rhino or 3DsMAX, but with a little bit out of the box thinking you can produce some amazing results. If any of you ever get a chance to go to Autodesk University it is well worth sitting in on Phil Reeds advanced Revit modelling session, because you will come away inspired to take your Revit modelling to the next level. This was a great bit of nerd nirvana. My kudos to you sir. It looks challenging, but worth a try. I think I'll give the Millennium Falcon a go. Thanks for the posting, keep up the good work. quality ! will you be posting your model file so we could download ? super impressed made me want to redouble my efforts ! quality ! would you share your model ? quality ! mate ! 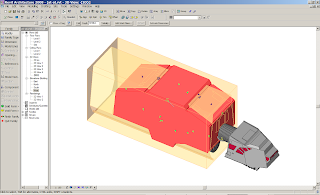 will you be publishing your revit file ?